Here's the beauty... my beautyberry has berries! 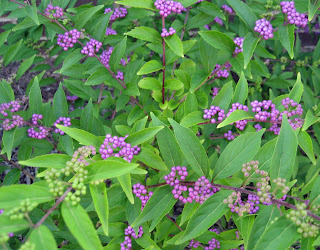 I first saw a Beautyberry on Pam's Digging blog and thought, "How pretty, but shoot, it probably isn't hardy in garden." And I was right. She grows Callicarpa americana, hardy to USDA hardiness Zone 6. I'm in Zone 5b. But then I found Callicarpa dichotoma 'Issai' last fall. It's hardy to Zone 5a. It's done very well so far. First, it survived last summer in a container in a garden center/nursery. Then I bought it and it rode in the back of my truck down the highway, with the wind whipping it around. (Well, it really didn't whip around that much, but it sounds better to embellish the story a bit, and 'tis the season to embellish stories, being as it is an election year.) Then it survived the winter. Then it grew with nothing extra from me. No extra water, fertilizer or mulch. Then it bloomed, tiny little white, insignificant blooms. Then, berries! This is Sedum 'Frosty Morn', one of my bloom day flowers. Nice blooms, but the plant doesn't seem quite strong enough to hold them up. (I mentioned in my bloom day post that it had gotten all floppy but didn't show a picture of what "floppy" looked like.) I'm going to leave it alone because these succulent-like stems tend to break off easily if you try to move them too much. In fact, I'm a bit surprised some of the stems haven't broken off under the weight of the flowers. Still, all in all, these Sedums are good fall flowers. I'm on the look out now for a couple of other varieties, including 'Purple Emporer' and 'Iceberg'. I always love beautyberry when I see it in blogs...I'll have to check again but I think it wouldn't like Davis which is why I've never end up with one. It looks very happy at May Dreams Gardens though! And just a touch of politics...is that your subconscious piping in?! I plan on putting a beauty berry in my new dry shade garden. It grows in ditches around here. Does that make it a weed? Maybe we should do a round of berries in the garden. I have quite a few right now. Beauty Berrry is one of them. I just love watching the Robins gobbling them. They become quite the acrobats for large birds when trying to get at the berries on the ends of those blousy branches. My beauty berry is a bare beauty, Carol... birds have already disappeared the purple and left the green. Yours looks great! It seems to have a very high berry-to-branch ratio. Carol, I had the same problem for years with what is probably that same sedum (looks like it) and then I started cutting it early in the season. I treat it like mums - pinch or cut back until July 4th and you'll not have that flopping problem and you'll still have lots of blooms. Try it! I think you'll be much happier with it. I'm so glad you posted that pic of the sedum. I have an Autumn Joy that looks just like that. I thought I did something wrong. Love your side-kick comments. My garden will be perfect next year too. The Beauty Berry is very attractive. Amazing how they travel home in the back of our vehicles and still live. Sometimes, my journey shakes all the soil out. I'm looking with envy at your American beautyberry. I planted 2 a couple of years ago and this was to be their big year. Unfortunately they are out in my very wild area and have had not a drop. It will be a good test of how native they are! 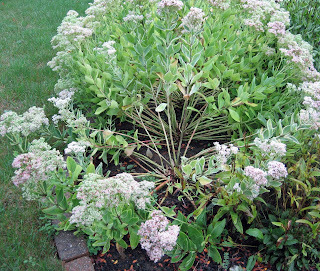 I second Kylee's suggestion - pinch or cut back the sedums -all of the tall ones-before 4 July by one third to one half. Then they are usually short enough not to flop. You also might want to try cutting the front half of the clump and leaving the back. That extends the bloom but since the uncut wil flower as usual and the cut will be a week or so later.Also te shorter front will help hold up the taller back. Can't take credit for the idea. It comes from Tracy D-S's Well-Tended Perennial Garden. That is one that is on my wishlist for my garden. (The Beautyberry) My sedums do the same thing, I guess if I was better about pinching back in the early part of the year maybe they would get bushier. At least the blooms are gorgeous. Your beauty berry is looking beautifully be-berries. Mine looks a bit sparse. 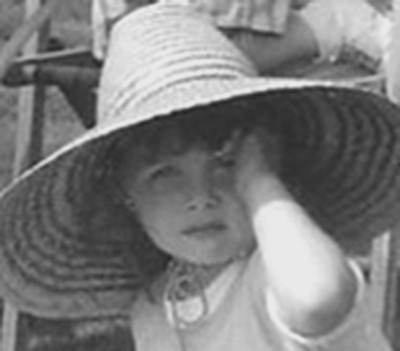 Lovely photo. My sedum always flop over. In some areas I stake them. Come by and visit if you have time. Carol, I have been paying attention to the sedums this year. Garden bloggers have shown beautiful photos covered with bees! Here's what I have noticed...those with excellent drainage never flop! Do you know how hard it is to get excellent drainage in heavy clay soil? But it's true, where I have excellent drainage they are like little soldiers standing at attention! You know, what Gail says makes a lot of sense, because my Sedum never flop, and you know how good my drainage is. I've got to get Callicarpa 'Issai.' Hardy with purple berries - what's not to like? I knew there were different varieties of beautyberry, Carol, and I'm happy to see you found one suited to your zone. It's a beauty indeed. I have always enjoyed my variegated sedum (looks a lot like yours, but don't know its name) from the moment it emerges right up to the time it starts to stretch out and set buds. Then I simply endure it until it reaches the stage where I can cut it all off to use in bouquets. It is exactly where I want it, but the drainage isn't great. Guess I will try pinching next year...thanks, Kylee & Acorn! I think Pam gave us all Beauty Berry envy. I planned to get one too and still haven't. I saw a few at Lowes when I was shopping for the neighborhood project. I doubt they still have them. I've purchased several "grow through rings" (my own description). They come in different sizes. Some are just metal wire circles, and some are circles with a grid throughout, all with 3 attachable/detachable legs. I place these over peonies, sedum, catmint, etc. Anything I want to give support as it grows. :-) Beautyberries are just that, aren't they? Thanks for the post. FYI, I bought 2 "Purple Emperor" sedums from White Flower Farm 2 years ago. They get full sun in average soil and no addtl water. The color is a lovely deep burgundy, but they have flopped over each season. Next year I'm thinking of cutting them back and just growing them for the foliage. Mabe skipping the flowers will keep the stalks upright.